In a recent workshop on waste discharge fee for food processors, the Western Agricultural Processors Association (WAPA) expressed concerns over the continuing increase in fees, especially in comparison to other regulatory fees. In addition, several WAPA members spoke out on the fees questioning the basis for the fees, lack of notification of a proposed fee increase, and the potential for double-dipping when the wastewater discharge is on to a farm subject to the ILRP. WAPA, along with the California Fresh Fruit Association, Nisei Farmers League, Agricultural Council of California and California Citrus Mutual, held a special “pre-meeting briefing” to get our members up to speed on the issue. Armed with this information, several of our members attended the afternoon workshop and objected to the fees. These members included almond processors, walnut processors, and pistachio plants. In addition, WAPA President/CEO Roger Isom and Director of Technical Services Christopher McGlothlin, spoke at the workshop expressing concerns on the WDR fees. Another workshop will be held in June. 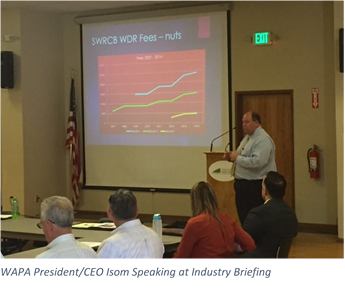 WAPA continues to press the WDR on the fees and is also working with the coalition to push for an audit of the SWRCB and the fees.